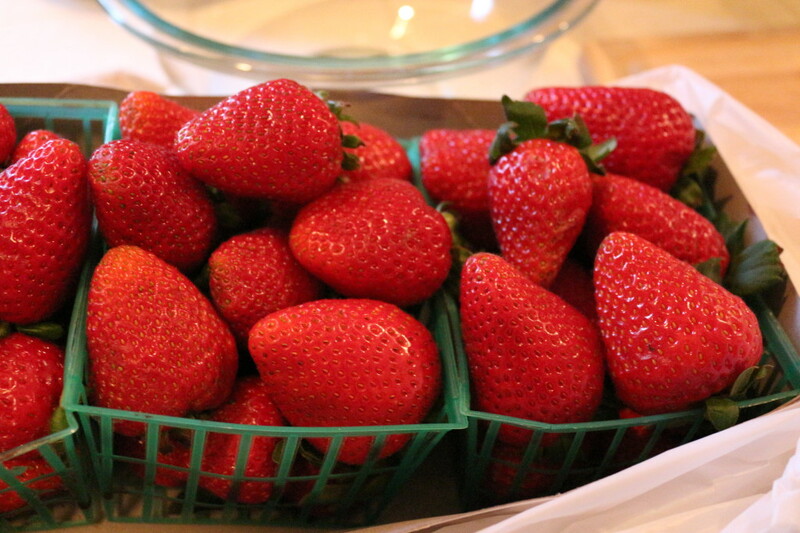 Summer is a great time to eat strawberries – they are red, juicy and fragrant. Since I was having a girls’ night last night with my best friend Nicki, and strawberries are one of her two favorite foods (the other is olives – yes, I know it’s a bit random), this recipe seemed like the perfect idea. This is adapted from my favorite food blog, Sprouted Kitchen. The recipe I offer below is a slight variation on what I tried last night — I think this will make the muffins a bit moister. 1. Make the melted strawberries: Preheat the oven to 350 degrees. In a bowl, toss together the strawberries, coconut oil or butter, and sea salt. (Note, if you want to skip the oil completely, that will work). Grease a baking pan well, or line it with parchment paper (you should line it if you forgo the oil) and spread the strawberries on it. 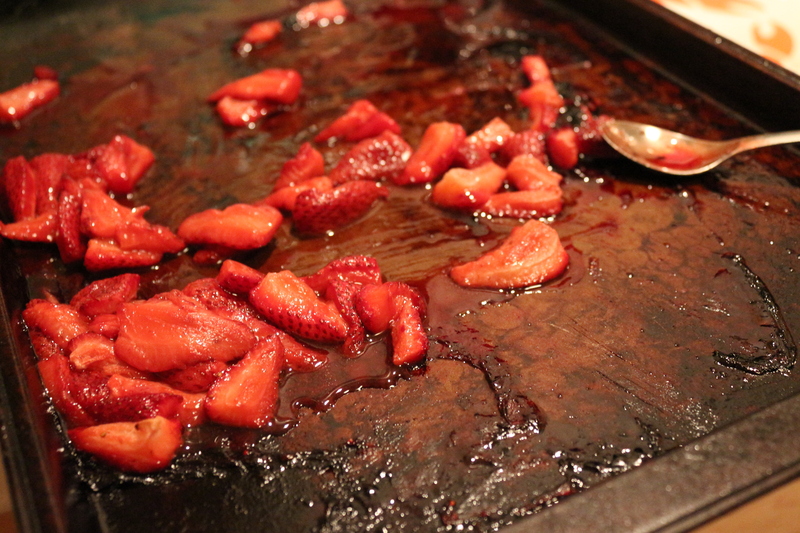 Bake for about 25 to 30 minutes until the strawberries release their juices and shrink down. Set aside to cool. 2. Make the muffins: Preheat the oven to 375 degrees. Line a mini-muffin pan with muffin liners or spray it generously (I used coconut oil cooking spray). 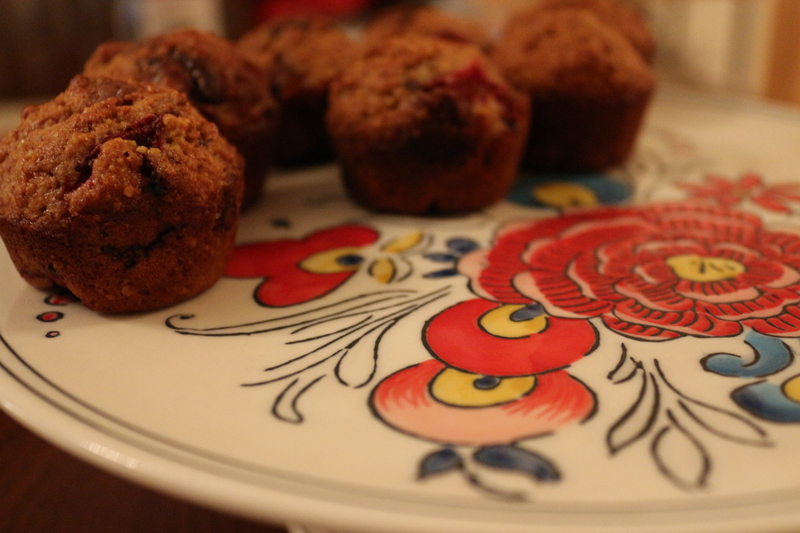 The recipe makes about 20 mini-muffins. 3. In a large bowl, combine the cornmeal, almond meal, oat flour, baking soda, sugar and sea salt. (I know this is a lot of kinds of flour, but I suggest using this mixture — the cornmeal adds a nice crunch, the almond meal flavor, texture and protein, and the oat flour adds nice flavor and fragrance. You can, however, substitute the oat flour with white or wheat flour.) Mix to combine. 4. In another bowl, whisk or mix together the egg, oil, yogurt, honey, and extracts. Stir until all the ingredients are well combined. 5. Pour the wet ingredients into the dry ingredients and stir until the wet is fully incorporated into the dry. 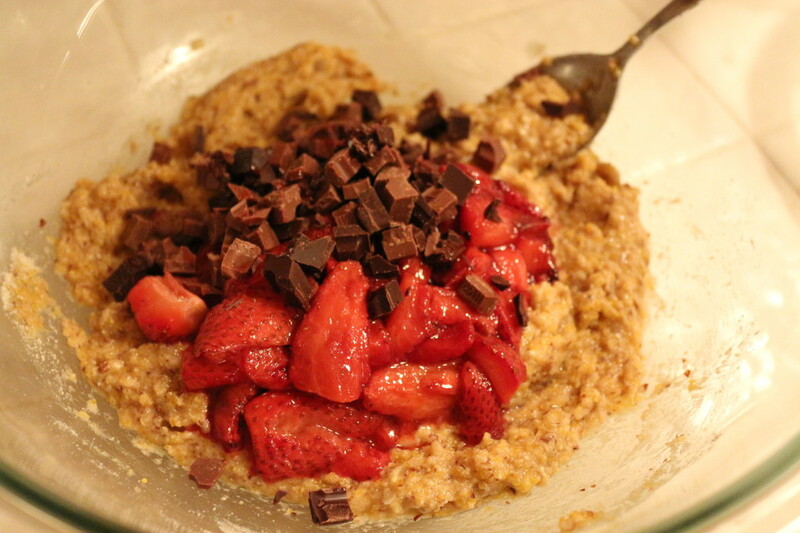 Then, fold in 1 cup of your melted strawberries and your chocolate or yogurt chips. 6. Spoon the batter into your muffin pan, filling each cup just to the top as these will puff up a little bit but not too much. Bake for about 16-18 minutes until the tops are golden and a toothpick comes out clean. 7. 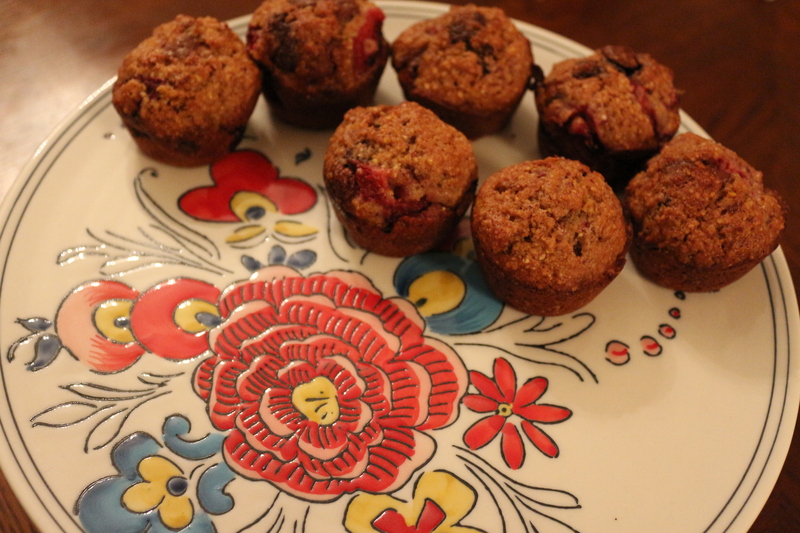 Allow to cool on a wire rack (or flip the muffins on their side in the pan), and then enjoy! You could always add jam or cream cheese to these, or eat them on their own. This entry was posted in Breakfast, Snacks, Sweets and tagged Chocolate, Gluten Free, strawBERRIES, Vegetarian. Bookmark the permalink.